Outside my home I have a small collection of rocks on an old crazed painted table. A couple of days ago I was out near the table when a quick movement caught my eye and as I looked toward the table, I saw this beautiful Skink. Even though I was several feet away -- the slightest movement I made resulted in the Skink's movement in quick tandem as it sensed my every position. I took a route away from the Skink and went inside to get my camera. 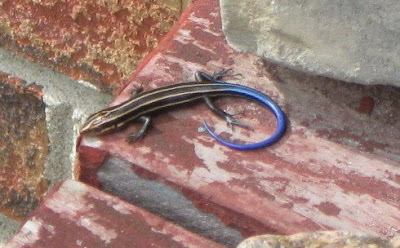 Although I knew it was a Skink I did not know its common name nor its "life style." I read different sites online that mentioned Skinks. I did find that it was a 5-line Blue-tail which are native along with a few other Skinks in this area of Kentucky. Also found an excellent site that covers the "life style" of the Blue-tail. After all this scouting around online I found out that what I had seen was a young female 5-line Skink. Males have blue tails when young but they eventually turn black or brown. The older female's tail fades to a dusty blue. The Skink on my table therefore was not a baby but a young female that measured about six inches. Babies are about two inches. These Blue tails are harmless. 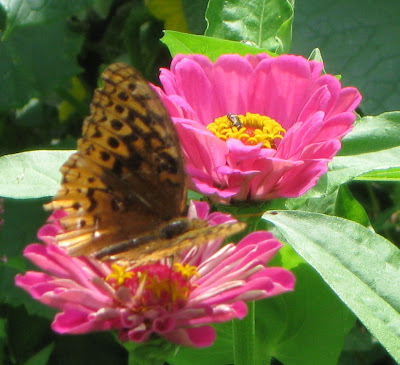 They are great in garden as they eat lots of insects. The "magical" thing about a Skink's tail is that is comes off if a predator is near and while off wiggles to attract the predator. Nature is amazing! The Skink grows back a modified version of the old tail. We have had so much rain starting in early Spring that my property is a holy grail for nature critters that relish water and 5-liners like water. I suppose this is why I have a Skink hanging around. Or perhaps they have been around and I just have not noticed. So much to take in at this place in the country. Fifty years ago Gene built the above home for his new bride and himself to live in and start a family. Built in the rural hills of Madison County, Kentucky, it was a beautiful place to start a life together. Gene was young and was just getting into the tree servicing business. He built the home himself out of recycled old wood that belonged to his father. 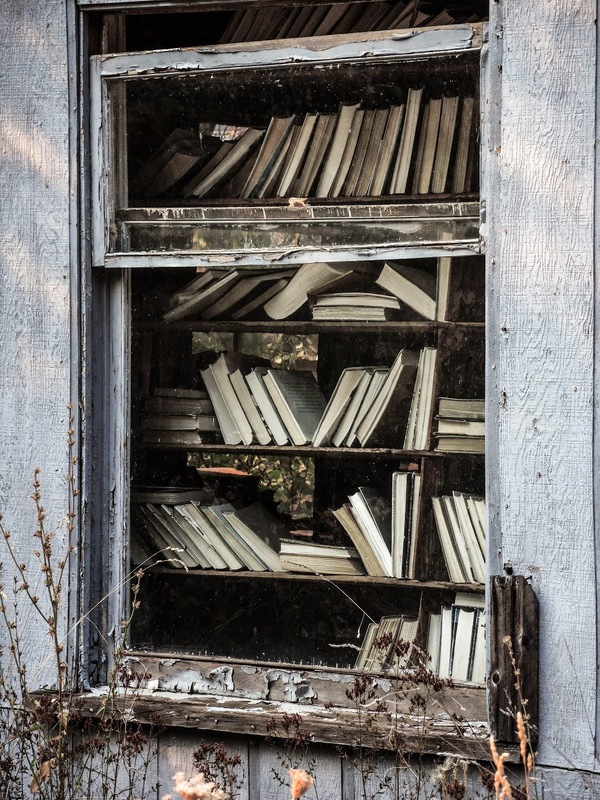 His father was a builder but on occasion tore down old buildings and recycled the wood. Gene selected mostly white oak from his father's stockpile to build his home. Gene learned how to build a Box type house from his father. His father was a local builder of homes in the Box type of construction. A local term that Gene and his father used rather than Box was "boxed." Click here for construction techniques. Another type similar to the Box type of construction is the Box and Strip construction type. With the latter, one uses one by three or one by four vertical strips and are nailed over the cracks of the vertical exterior boards. Basically the Box construction method is to establish a square wooden foundation with floor joists then covered with wooden flooring. The walls are nailed vertically to the sides of the foundation and a ceiling plate is nailed to secure the top of the vertical boards. 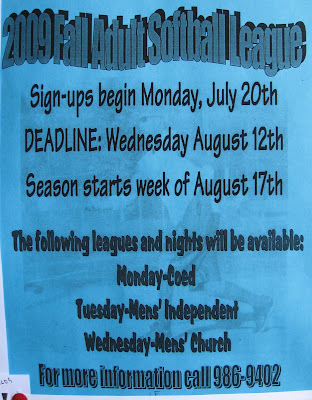 There are no studs. A roof is usually a gable constructed type. This type of construction can be traced back to the continent. It is an easy and efficient way to establish housing. Gene and his family lived in this house for 13 years. The first two years they did not have electricity nor water. Water was available from two springs further up the hill so they walked up the hill constantly to get their water. Sometimes Gene hauled it in from other sources. It was a double pen house at first -- two rooms wide and one deep. Later, Gene added an addition to the back of the house which has since been torn down. 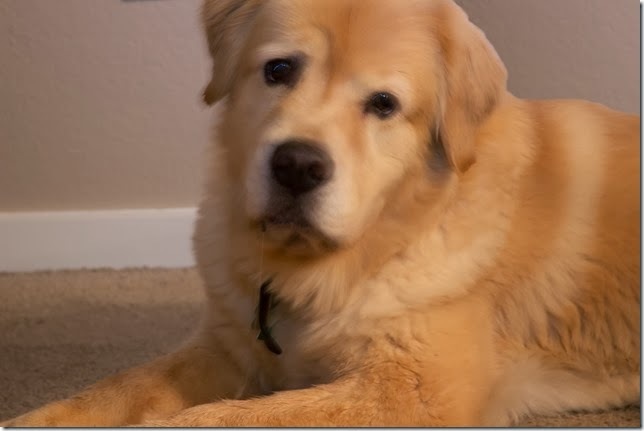 They had six children in this house when Gene built a large ranch house on his property. He stills lives in the ranch house and is still active in a successful tree servicing business after being in it for 51 years. My father was a tomato gardener. Oh, he grew other vegetables but tomatoes were his specialty. Perhaps this is where I developed my interest and taste for tomatoes. He grew a large garden when I was young in which I always got to put down a seed row of some vegetable and call it my own. Then as he aged into his sixties and no longer had children at home he reduced his garden in size and only grew tomatoes and green beans. My mother and father canned their tomatoes and green beans into their late sixties. Then in his seventies he dialed down his plantings even more -- his garden became diminutive where now he only grew tomatoes -- "there's nothing like a freshly picked home grown tomato sprinkled with a little salt," he would always say. I feel I am following in my father's footsteps. 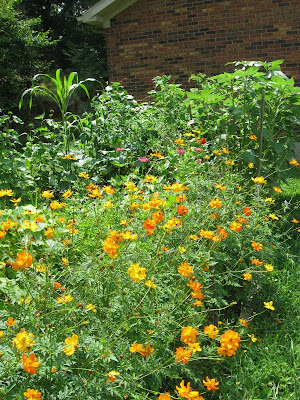 At one time I had large gardens but now, as I age, I'm down to a " garden patch." 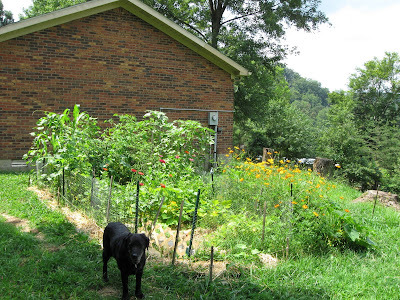 Its about 20X8 and is stuffed with all kinds of vegetables that seem to cover almost the whole little garden. My "garden patch" is just the right size for me. 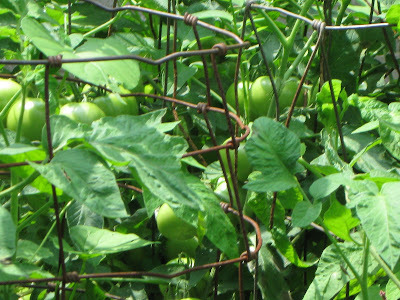 I threw in starts of organic tomatoes along with herbs such as basil, dill and cilantro. Then as I had so many seeds left over from last year I just sowed them and kept my fingers crossed that they would grow. Some seeds were several years old. Everything sprouted even the flower seeds I threw in at the last mnute for color. Only the bush beans didn't grow well but I believe they did not like the early spring rains and retaliated by producing little. But the rest -- bountiful! Squash, Zinnia, Golden Cosmos, Bachelor Buttons, Herbs, Broom corn, Cucumbers, Sunflowers, Lettuce, Kentucky Climbing Beans, Heavenly Blue Morning Glories and of course TOMATOES. Here's to you Dad! 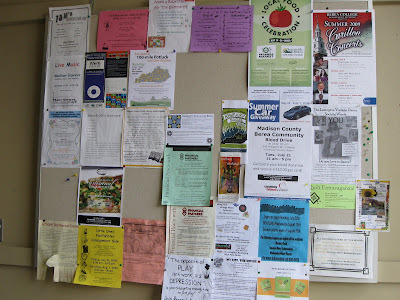 I have observed that folks like to read bulletin boards. 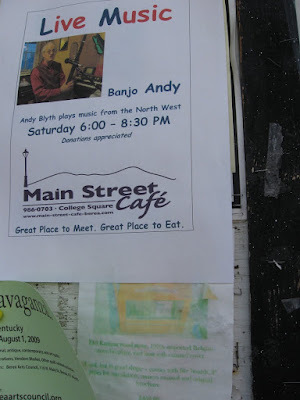 For some it is like reading a story of what the town is all about. 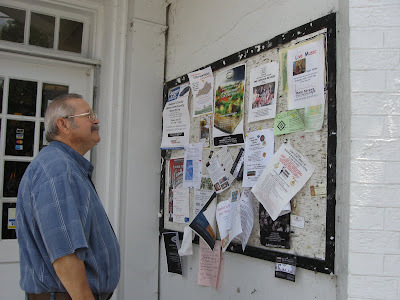 Small town boards are especially interesting as they usually only have locals putting up their flyers for coming events, services and other assorted needs and wants. 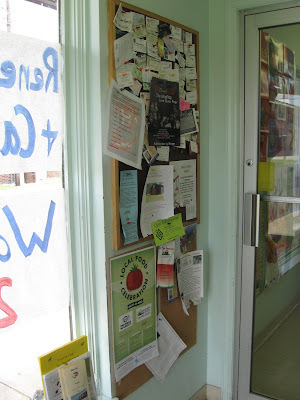 Bulletin boards are a great community resource. Usually found in several places around town provided by local merchants and public institutions who provide them free for community use. 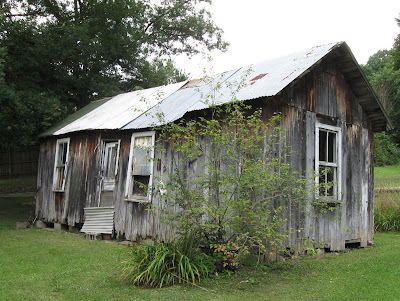 Many times we come upon a solitary building that has lost the other outbuildings of its farmstead. One cannot quickly decipher where the other outbuildings or house were located -- one has to read the language of the landscape for clues if any still exist. This is the case with the above crib. It is the lone remainder of a farmstead that once stood in Climax, Kentucky. No clues remain on the landscape of other buildings. 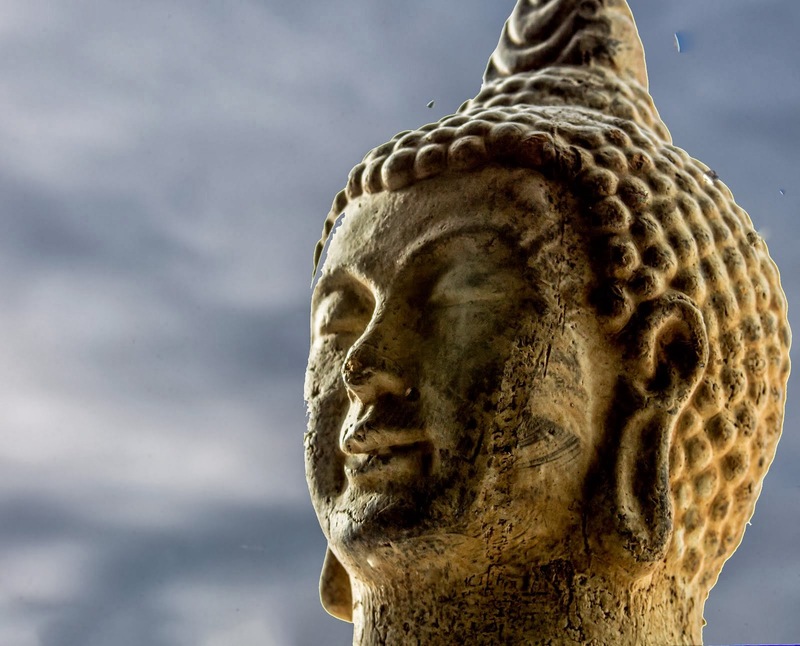 All one can do is to read the language of the materials and shadows of construction to figure out when it was built. 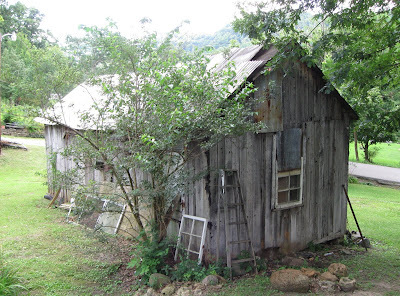 This type of crib is a "plain type" defined by Montell and Morse in their book, Kentucky Folk Architecture. The small gable end door-opening is for loading the corn for storage. 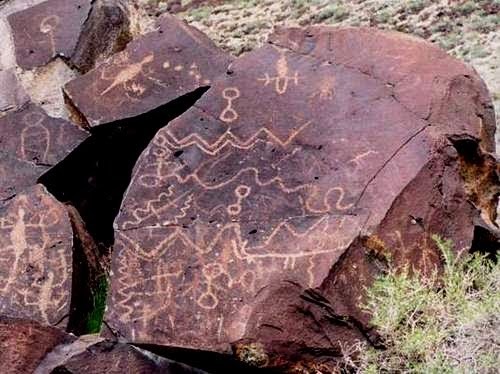 Henry Glassie in his book, Pattern in the Material Folk Culture of the Eastern United States, mentions that the rectangular floor plan along with the projecting gable roof originated in the continent possibly in Neolithic times. Neolithic times was the first period of agriculture. Thus it surely can be said that it is a traditional form as it has been so over eons of time. 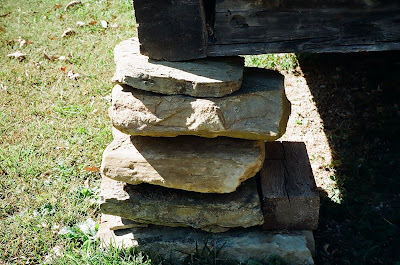 PILED LIMESTONE ROCK FOUNDATION ACT AS LEVELERS TO THE WHOLE OF THE CORN CRIB. The logs are prepared in two ways for the crib. First the sawing of timbered wood into logs. 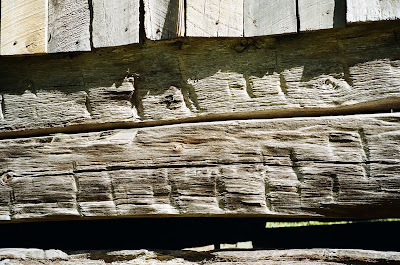 The horizontal logs of this crib have slight indications of primitive sawing methods probably done in a saw pit with two men each working the timber into the horizontal log members. Presumably, no saw mill existed in the area to produce the horizontal logs needed. Secondly, the logs are squared for even stacking--squared by hand with an adze. The vertical wood (not part of the log system) seen above in the photo is part of the small doorway in the gable end of the crib. 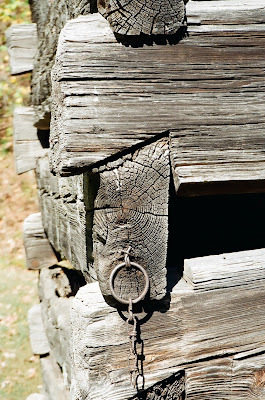 Half dovetail notching is only one of several types that were used for early horizontal log construction. Notching is a corner construction technique and physically notches two log together. Half dovetail has a dovetail only on the upper end of the log while leaving the lower end flat. Notching gives stability and immovability to the logs. Log home building with notching construction was brought to this country from Europe by early settlers. Many log houses were built in the eastern part of our country, the largest population of them being located in Kentucky. Timber was a ready resource and the pattern (or know-how) was in the mind of the builder. Many log houses today in the Upland South are covered over with wood weather-boarding as log became a mark of poverty over time. 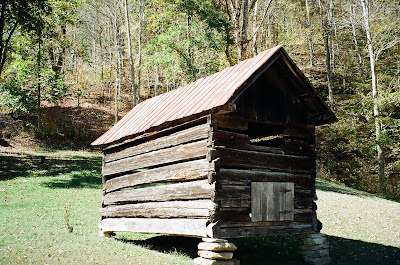 So in a brief look at this particular log crib we know that it is closely related to the time of early settlement, that the form is traditional, that hand tools were the technology, that the form was a traditional one from Europe, that saw mills were probably not in the area and a crib usually was part of early sustainable farming in Kentucky. My guess as to its age is somewhere in the 1800s. A broad range but still we are able to know something about it given the circumstances. Further research could give more social context to the corn crib. 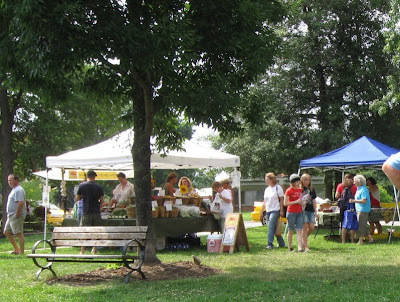 ONLY LOCALLY GROWN PRODUCE, PLANTS, AND LOCALLY MADE PRESERVES CAN BE SOLD AT THIS MARKET. SALAMANDER SPRINGS ORGANIC PRODUCE BOOTH. 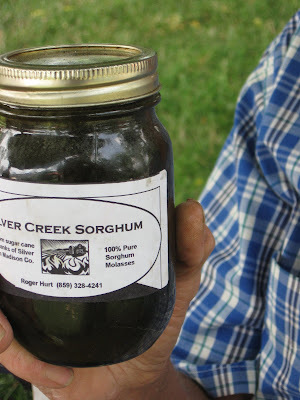 FRESHLY MADE SORGUM FROM SUGAR CANE GROWN ON SILVER CREEK FARM. 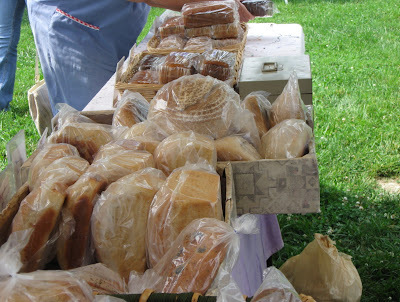 DELICIOUS BREAD MADE FRESH BY JOYCE BEGLEY FOR EACH MARKET DAY. A ONE-WOMAN OPERATION! 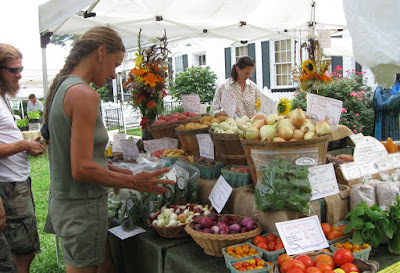 TABLES OF "THE BEST OF THE FRESH" VEGGIES -- ALL LOCAL PRODUCE-- MARKET DAYS ARE EVERY TUESDAY AND FRIDAY AFTERNOONS. AT THE BEREA FARMERS MARKET MOST PRODUCE IS NO-SPRAY OR ORGANIC. 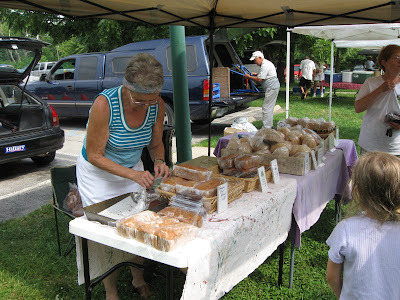 NO CRAFTS NOR COMMERCIAL PRODUCERS CAN BE FOUND AT THE BEREA MARKET. 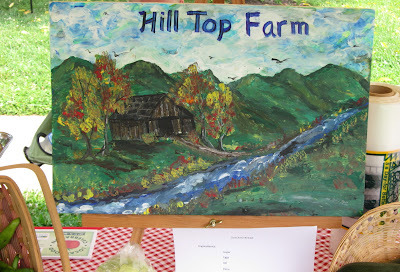 SUPPORT THE FARMERS MARKET NEAR YOU! Recently my daughter Elizabeth and granddaughter Whitney were visiting me all the way from Salt Lake City, Utah. Above, they are standing among the limestone fences at Pleasant Hill, a Shaker Village in Kentucky that was founded in the 1800s and now is a museum. A museum in financial trouble, such as many of our wonderful museums across the country are, due to our declining economy. But today I am thinking of Whitney. Her mother called excitedly to tell me she just received two letters from her. Whitney sent them from the tennis camp she is at for two weeks learning new techniques of tennis -- she is an avid tennis player at the age of twelve. Personal letters are an old tradition in our culture that secure connections between folks. . But like the museums -- they are in a steep decline. Not because of the economy but because of technology. In the past (and some even now) people wrote letters, people received them, people saved them, people reread letters often, and sometimes even framed a particularly special one. Many of today's original research is based on the information they contain. 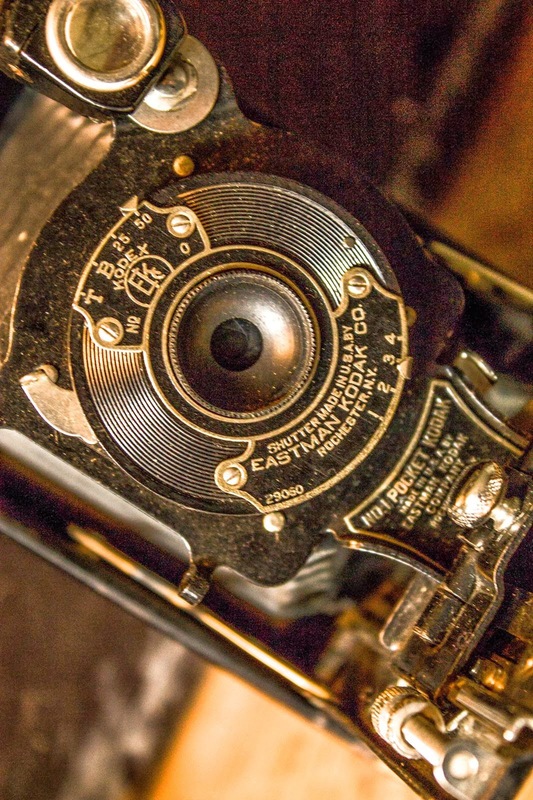 Letters play a part in both the research of folks as well as family histories. Letters are the silent language of the person that writes them. The language is reflected by differing writing styles, sometimes doodles or sketches, sometimes enclosed articles, envelope styles, paper styles, stamp designs, writing objects with ink pens of all colors as also with pencil, sometimes old type from extinct typewriters, containing somtimes enclosed photos and more. And most of all -- the lines of voice touching you with their feelings. Elizabeth's husband, Bill, mentioned to Elizabeth that those two letters will probably be the only ones she will ever receive from her daughter. Taken aback, she asked what he meant by that statement. Well, he said -- its a different world and from now on it will probably be all emails. Gives one pause to think. What can one say about the silent language of an email? Tradition -- Michigan Cottage on the 4th of July. They are 11,037 inland lakes in Michigan. Surrounding most of these lakes are cottages. Many of these cottages are only used in the summer time. The 4th of July is one of the peak times that they are used by family and friends It has been this way for decades and has become traditional and ritualistic in Michigan to celebrate the 4th "up at the cottage." I was raised in Michigan and am very familiar with this tradition. My cousin Charlene lives in northern Michigan and has a summer cottage fairly near her home in Traverse City. 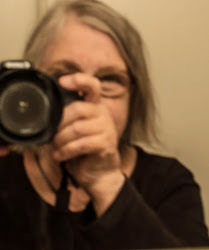 Summers are spent there painting watercolors, keeping the place in good repair, growing a small garden in pots on her porch, kayaking the lake with her husband and being a good steward of the ecology of her section of the lake. 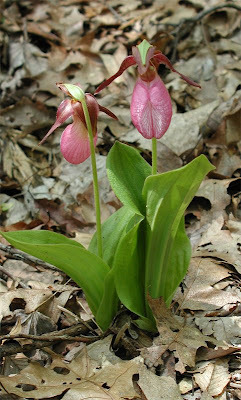 She leaves Mother nature to herself and is rewarded by native "sweet smelling" water lilies in July and lovely wildflowers such as colonies of pink lady slipper (or moccasin flower). Some of the recent-comers to the lakes in northern Michigan bring their suburban mentality to their summer places. Tearing out the native plants along the waterfront and around the cottage. They plant commercial grass and bring sand in to fill in along the waterfront. 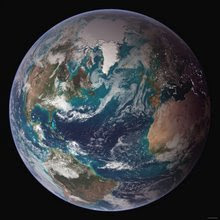 They complain that the fish population has been declining -- not thinking that the native water and land plants needed for wildlife and fish are being depleted by they themselves. Their motto is, "there is no place like home," even if means bringing suburbia to nature's northern lake fronts. Difficult to assess the damage to the lake environment by some of the suburbanites of southern Michigan. Hopefully, they will notice places like Charlene's and see that the natural beauty of wildness is better than their fake lakefront reality. 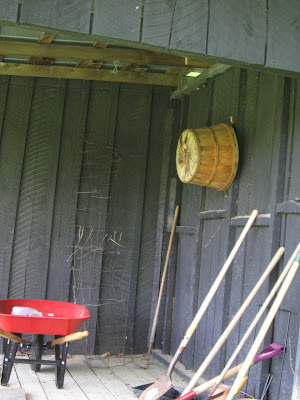 This spring I went to take my work bushel-basket off my shed porch wall and as I lifted it down I noticed some extra weight to it plus some odd twigs peeking by the edge. Oh --- maybe I have a new tenant? 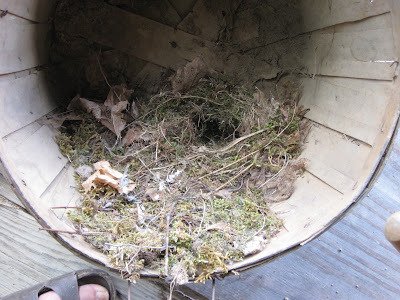 I looked into the basket and there was a beautiful Carolina Wren’s nest. The nest was empty but freshly made as the lichens used in its construction were as fresh as a dinner salad. The lichens were mixed mainly with pieces of weeds, old leaf litter, and tiny twigs making a great nest for a new beginning. One thing was a bit odd about the nest. It had a landing pad leading up to the nest -- one obviously built by the wrens. The pad was made of the same materials as the nest. I had read someplace that sometimes Carolina Wren nests have landing pads. I don’t really have an answer as to why this is so. Yet, the nest did not have any eggs nor young birds. Apparently the nest was just short of completion. My guess was that the mother wren was in the process of lining the depression in the inside of the domed shaped nest. Although the male and female both construct the nest, it is the female that puts the finishing touch on the lining. I decided, after I hung the basket back on its hook, to leave it there until I was completely sure the wrens had raised their family and were fledged. 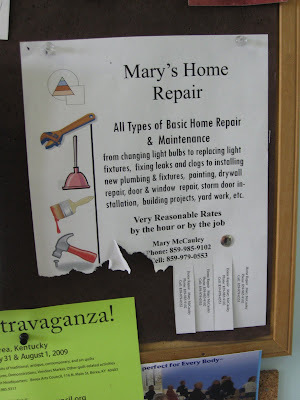 At this point I had two concerns: one, I had scheduled a workman to work on the shed (saws, hammers, noise) and two, the neighbor cats that are constantly checking my field for rodents. I solved both problems by canceling the workman until all was clear and leaving my dogs outside for a good part of the day (cats are scared of Lil and Sal). While in the yard working or relaxing, I occasionally observed the comings and goings of the wrens to their nest. Basically there seemed three phases. The first was a time of low activity. I figured this was the time of finishing off of the nest. The second period was fairly active. My thoughts were that the female was nesting on the eggs and the male was bringing her food. The last and third phase was a very active time when I figured there were many mouths to feed. 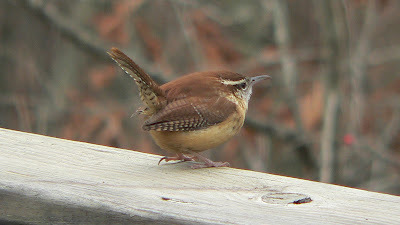 During all these three stages I had such glorious Carolina wren songs performed near my house, from sun-up to sundown. The repertoire was multiple. The male is the songster and he would sit on my porch railing and really belt them out with his head raised up like a dog howling to the moon. Now the young wrens have left to other places. I miss the male "operettas" on my porch railings. I hear the wrens farther back in my woods and occasionally near the house. 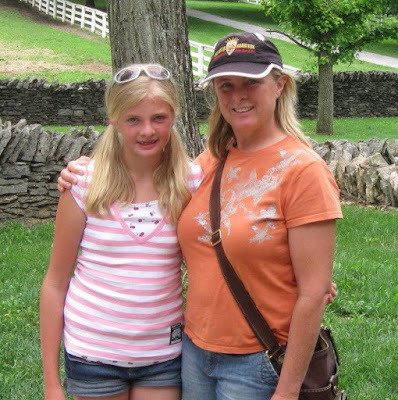 I never did see the fledglings – but my daughter Elizabeth did when she was visiting. She counted four. Carolina Wrens are found in the eastern part of the United States -- mate and stay in the same territory for life. 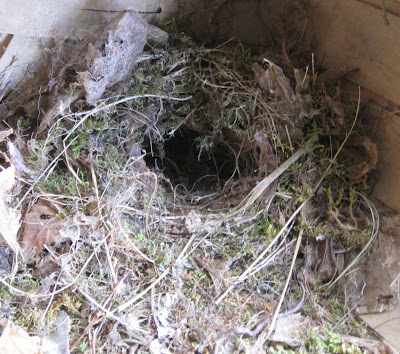 For a great ID guide on bird nests I recommend the book titled Eastern Birds' Nests.